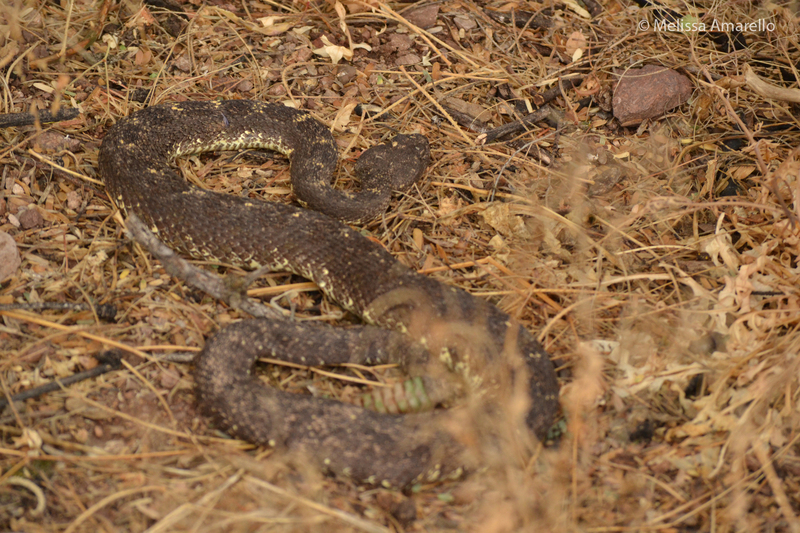 I’ll end this week’s roundup of snakes with the snake that started my obsession with rattlesnakes, black-tailed rattlesnakes (Crotalus molossus, hereafter blacktails). Many, many years ago, I attended the International Herpetological Symposium just for fun, as the only reptiles I worked with at the time were of the feathered variety. I met (who is now) my oldest and dearest friend at that meeting, who was key in reawakening my lifelong love of snakes. And there was a presentation that blew my mind and changed the course of my life forever. Harry Greene talked about his black-tail project and in particular that they take care of their kids. Snakes? Take care of their kids? So long birds! It was five more years before I started my first rattlesnake project and I haven’t looked back since. I still haven’t seen parental care in blacktails, but I have gotten to see them do some other really cool things. Jaydin (male) in a tree. Persephone (female) in a tree. Jaydin (left, male) and Persephone (right, female), 24 July 2012. Timelapse video of Jaydin courting Persephone (one day of that courtship). Jaydin in combat with Marty over Persephone. Maybe this will be the year, 15 years later, that I finally get to see a blacktail family (Persephone, please?). Who says dreams don’t come true? At a certain time of year, a male snake focuses his efforts on breeding. He moves long distances in search of potential mates (a video of this behavior, scent-trailing, can be seen here). However, finding a female is only the first step; now he must convince her to mate with him. A pair of black-tailed rattlesnakes: Jaydin (male, left) and Persephone (female, right). 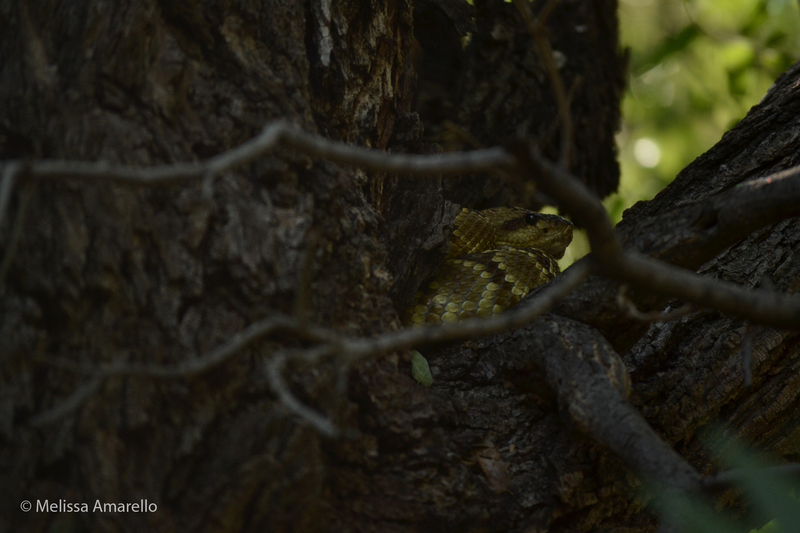 Rattlesnakes are great romantics. Males may spend a week or more courting one female to convince her of his worth. How he does this is the subject of today’s post. A male may sit nearby, next to, or even stacked on top of a female, presumably to guard her from other suitors. 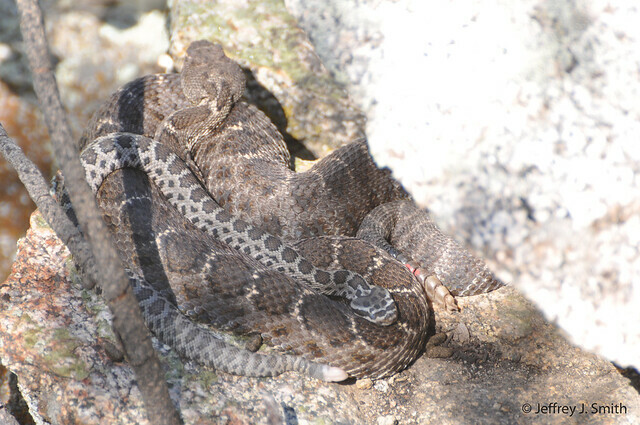 Male western diamond-backed rattlesnake stacked on top of a female. Can you see her face? If another male comes to call, they may engage in combat over the prized female. We will discuss combat in more detail in a future post, but for now let’s look at courtship through our favorite snake, Jaydin (male black-tailed rattlesnake). On 18 July, we were excited to see Jaydin with a beautiful female, who we now know as Persephone. Persephone (left) and Jaydin (right). Jaydin crawls out of their shelter first and coils at the bottom left of the screen. Persephone emerges shortly thereafter. Jaydin immediately goes to Persephone and begins chin-rubbing her, which is exactly what it sounds like: he rubs her body with his chin to express his intent. This behavior starts about five seconds in and continues throughout. Much more vigorous chin-rubbing can be seen in the following videos. 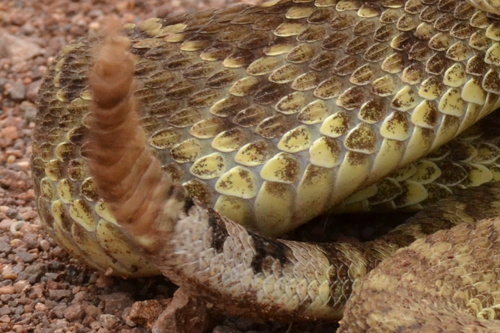 At ~eight seconds in, the female Arizona black rattlesnake literally smacks the male in his face with her tail. Does this mean “no” or “not yet”? We also don’t know how much rejection a male will take before he gives up or how much chin-rubbing a female needs to acquiesce. …and two days after that. The fourth evening (21 July) Jaydin moved and we assumed that courtship was over. His signal was again coming from overhead, which seemed an unlikely place for courtship. But Persephone likes to climb as much as Jaydin does. Jaydin & Persephone overhead in a tree, 21 July 2012. 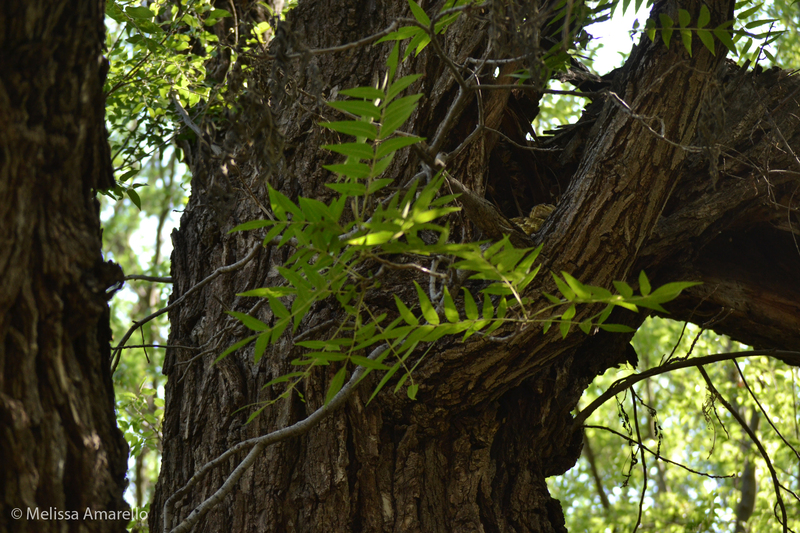 Jaydin & Persephone as seen from a nearby tree, 21 July 2012. After three more days, they were still together at a new spot on the ground. Again we set up our camera here to record their behavior. A week-long courtship ends in mating! Sometimes it is difficult to tell, but Jaydin was never camera-shy, so he made it very obvious for us 🙂 (Check out the video at ~55 seconds). As you may have guessed, this is not the last you’ll see of Persephone, Jaydin and Persephone, or the new male. Stay tuned for more! 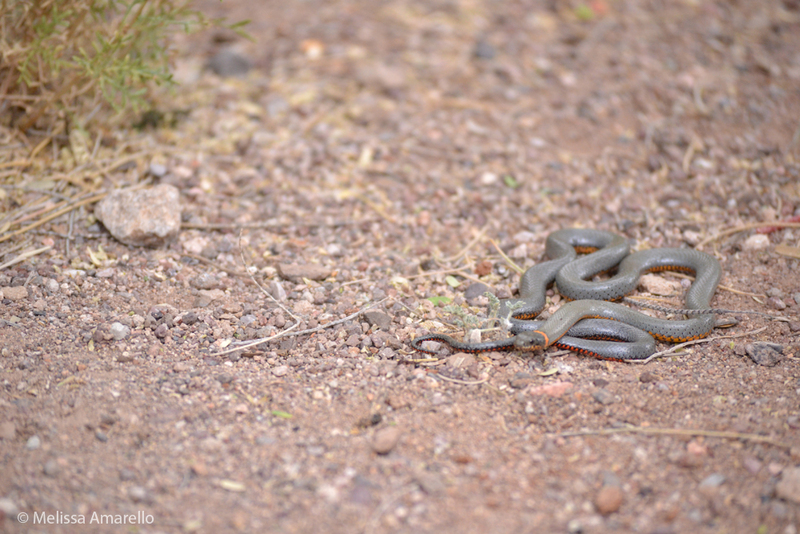 For a very different story of snake courtship and combat, check out Ménage à trois, a story of three gophersnakes. 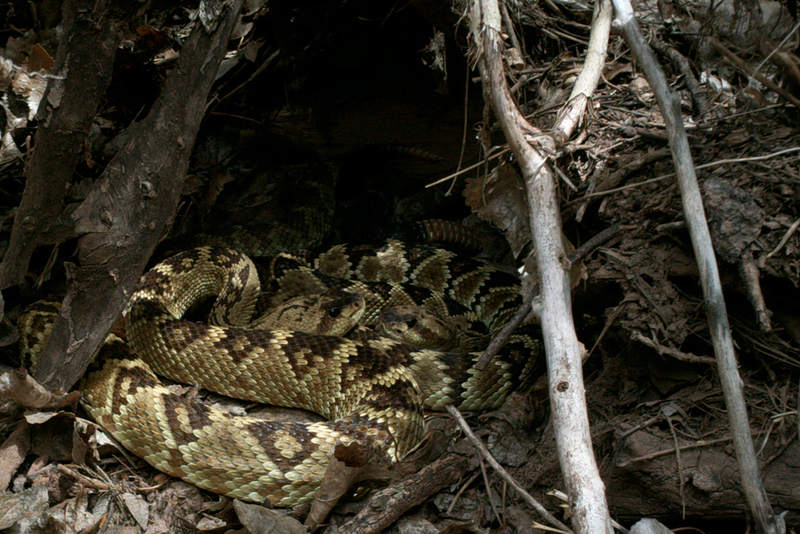 Jaydin, male black-tailed rattlesnake (Crotalus molossus), August 2011. 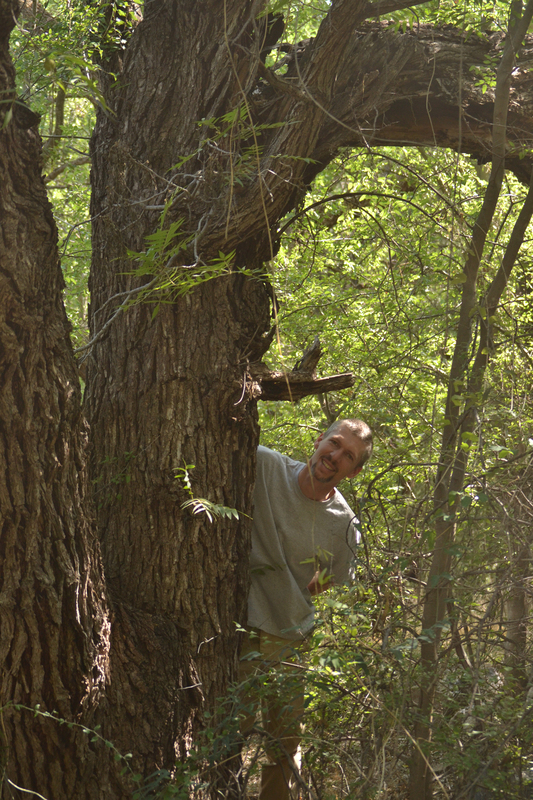 In August of 2011 we visited the Muleshoe preserve for the very first time. As we drove through the entry gate, we heard the telltale buzz of a rattlesnake moving in the underbrush beside the driveway. While this would normally be regarded as a warning alarm, we interpreted it as an auspicious sign. This hefty and handsome male black-tail would herald not just a new study site, but our eventual home. 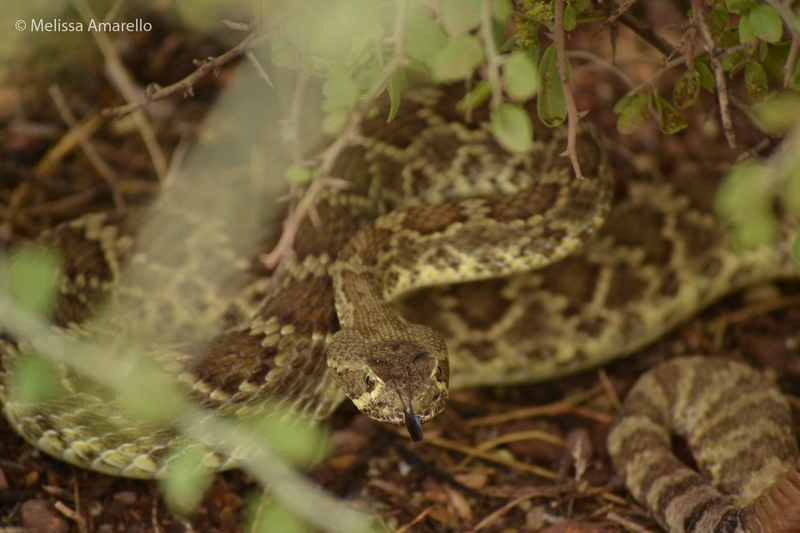 One month later, when we officially began the study, we captured and implanted a radio transmitter into a black-tailed rattlesnake in Hot Springs Canyon, dubbed Jaydin by the volunteer that found him. When later comparing photographs of head patterns, we were tickled to see that Jaydin was the very same snake that greeted us a month before! Since then, Jaydin has (almost) always been a treat to check up on. From climbing trees to courting females, he let us into his world like no other snake we’ve followed. With the summer of 2012 behind us, Jaydin was right where he was the year before, apparently headed toward the same rocky hilltop to spend the winter. Sadly, Jaydin never made it. On 25 October we found his predated body on a barren slope that would have afforded him little cover. This post is the first of a series in tribute to Jaydin; he left us with no shortage of stories to share here. The following video demonstrates Jaydin’s typical disregard for our watching him. It was recorded the afternoon of 31 July 2012 and we think he was scent-trailing a female because we later observed one nearby. Note how thoroughly and intently he tongue flicks during his search. We miss Jaydin and we are grateful for all that he shared with us. For over a year he enriched our lives, and through these posts we hope he’ll enrich yours too. Wow, it has been awhile, but I won’t bore you with the details of why we’ve been absent. What’s important is that WE’RE BACK! 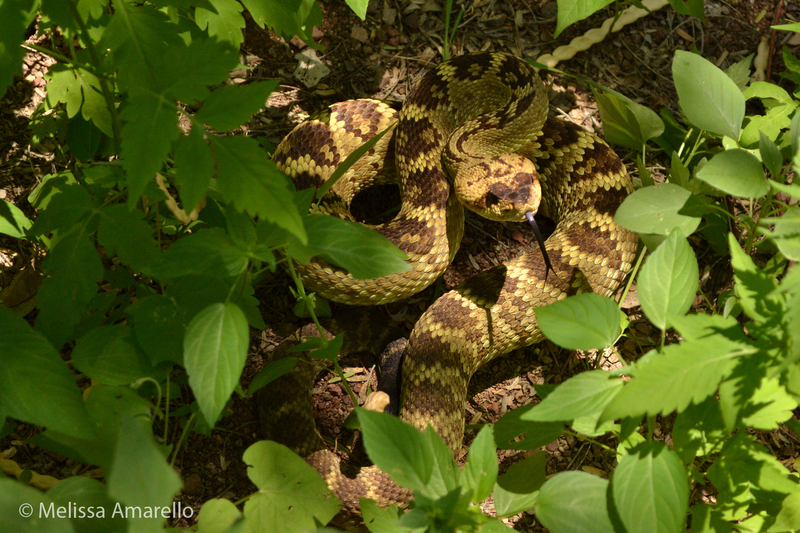 We (and the snakes) had a busy summer and even though the snakes will be headed to their dens soon, we’ll have plenty of stories to share all winter long while they’re waiting for the spring. When we started this project one year ago, we implanted radio transmitters with one-year batteries into seven rattlesnakes. So we made the somewhat difficult decision recently to remove those transmitters and give most of those guys a break. They deserve it, but we’ll miss them. We said goodbye to: Henry (male western diamond-backed rattlesnake), Stuart (male western diamond-backed rattlesnake), Boyett (male Arizona black rattlesnake), Glendy (male Arizona black rattlesnake), and Barney (male Arizona black rattlesnake). Wait a minute, Barney? Who’s that? We lost Barney last October, but he appeared like magic this September, pretty much right where we originally encountered him. Where did he go? Who knows, but at least we know he’s OK.
We (OK, mostly me) couldn’t bear to let Jaydin (male black-tailed rattlesnake) go, so he is still with us. 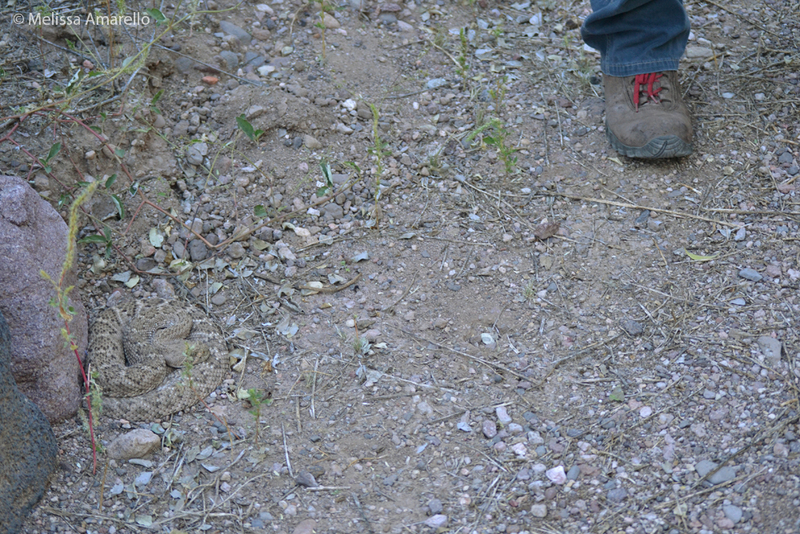 Henry (male western diamond-backed rattlesnake) at the head of the Nature Trail, 5 October 2012 (Henry, bottom left; Jeff’s foot, top right). Now let’s meet the new guys (and gals!!!). We can’t take credit for finding this beautiful girl, Jaydin led us to her. The full story deserves (and will get) its own blog post, but the short version is that Jaydin courted Persephone for about a week this summer. She is named for the Greek goddess Persephone, queen of the underworld. 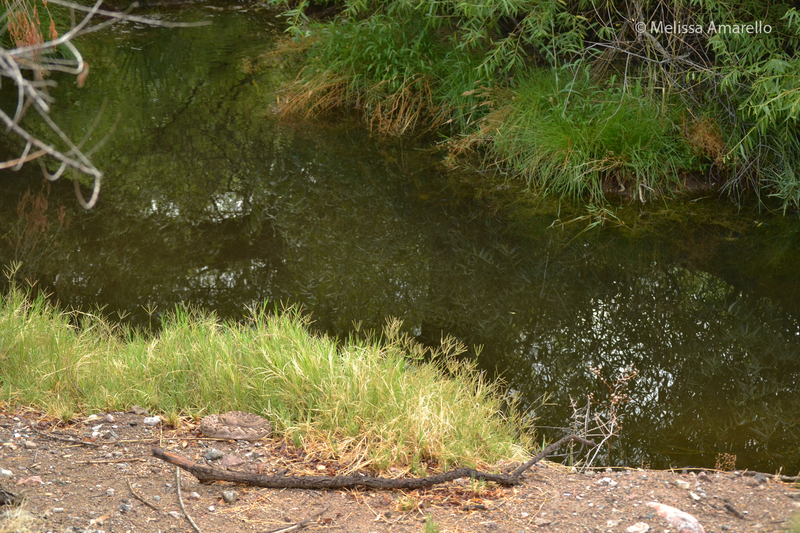 Bane was originally encountered during Snake Count Spring 2012, when he was spotted drinking from Secret Springs. At that time we measured, marked (painted his rattle) him, and set him free. He re-entered our lives in August while we were sitting in the wash, recording data and taking photos of Jaydin. Along comes Bane, cruising through the leaves a few yards from where we sat; it’s almost like he volunteered for the study. 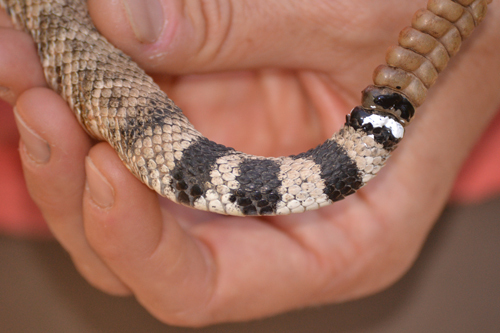 Bane was named for the main villain in The Dark Knight Rises, which may seem a little odd given that we’re trying to improve rattlesnakes’ reputation. Bane certainly caused a lot of trouble for Gotham, but we appreciate his ‘for the people’ attitude and his soft side, which I won’t elaborate on in case you haven’t seen the movie (SEE IT!). We again hosted the field biology class from Bangor University this fall. Whilst discussing social rattlesnake behavior in the Commons, Cathy crawled onto the patio just outside the door (another volunteer?). She is named for one of the professors leading the class. Help us name this snake! Jeff came across this little lady while tracking Glendy in August. Like Glendy, she has a fondness for the mesquite forest and only recently traveled to Hot Springs Wash, probably on her way to her den. 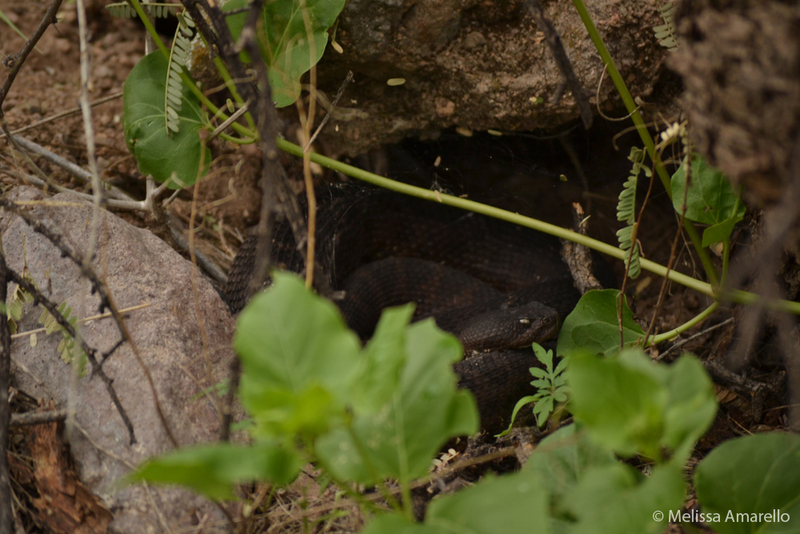 She was the first female Arizona black rattlesnake we found in Hot Springs and she is a young adult. Please help us name this snake! Email us your suggestions; we’ll pick the top 3-5 and have a poll on our facebook page to choose the winner! Update: We have a winner! Luna was the name chosen by our facebook fans. How many snakes have you walked under? 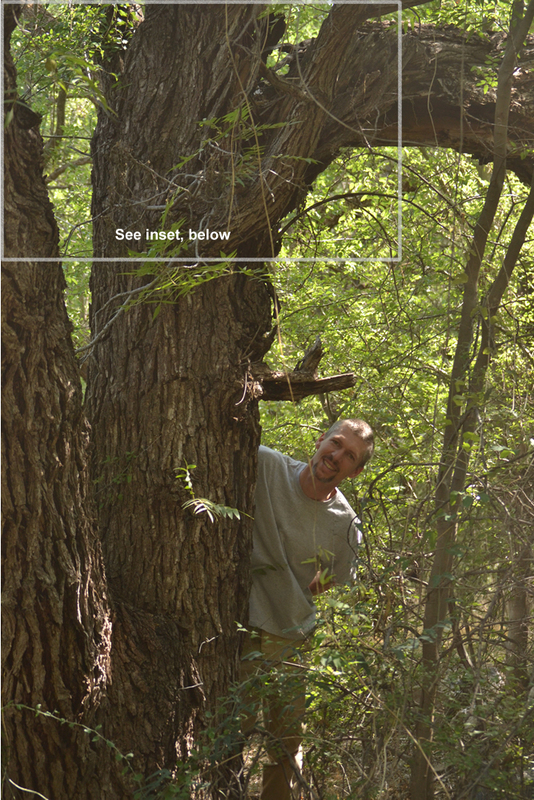 Jaydin, about 8 feet up in a walnut tree above Jeff. 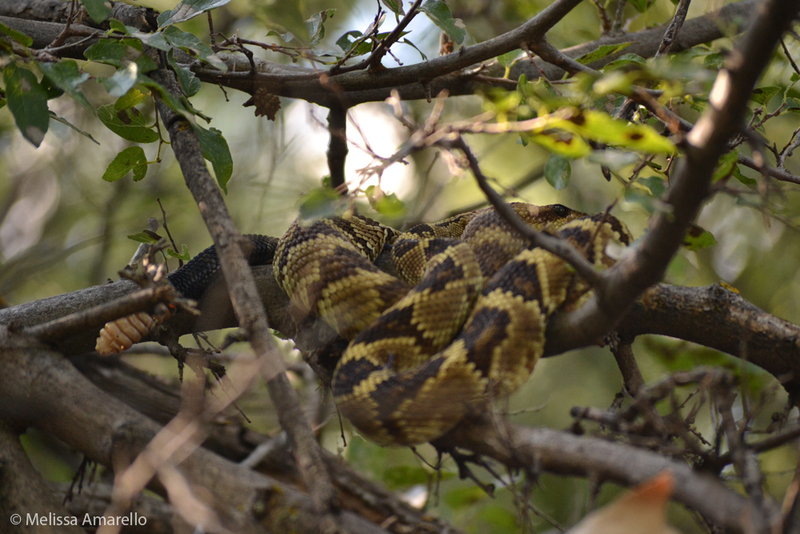 Rattlesnakes do climb, but they’re not often caught in the act. About 6:30pm, 3 July 2012. 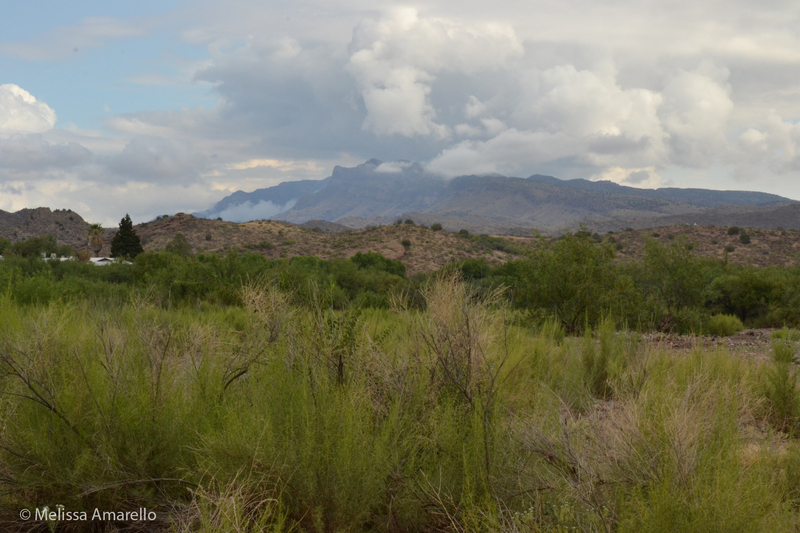 Though we had a few tantalizing sprinkles in June, the monsoon officially arrived last night. We got about a half inch of rain at headquarters and the 4th of July has started out cloudy and cool. 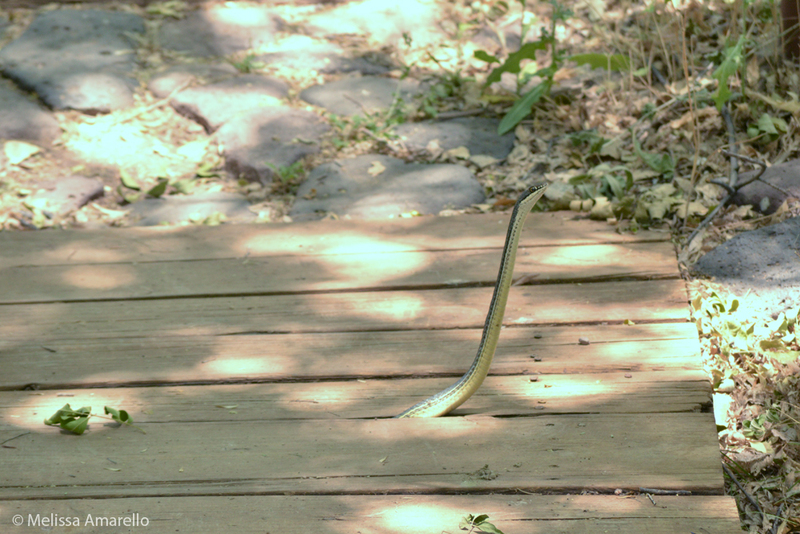 For the first time in weeks, every snake we checked on this morning was visible on the surface. Henry (male western diamond-backed rattlesnake) was sitting out next to the twin lakes this morning in the mud. While we were recording data, he left his favorite crater and moved into the grass. Henry, coiled in his usual crater, 4 July 2012. Henry in his new spot in the grass, 4 July 2012. We next checked on our other western diamond-backed, Stuart, whom we haven’t seen in a couple weeks. 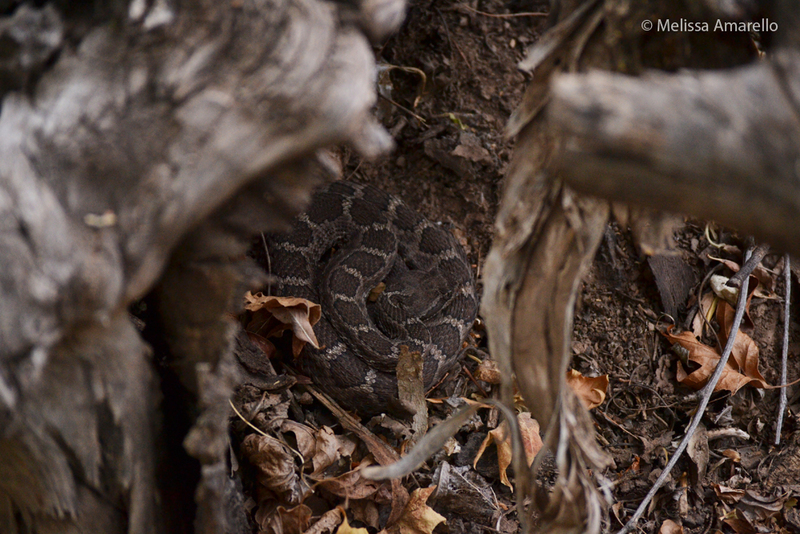 He’s been in a burrow at the base of a mesquite tree, where we assumed he was preparing to shed his skin. This morning he had moved into the wash and was coiled on the surface, freshly shed. 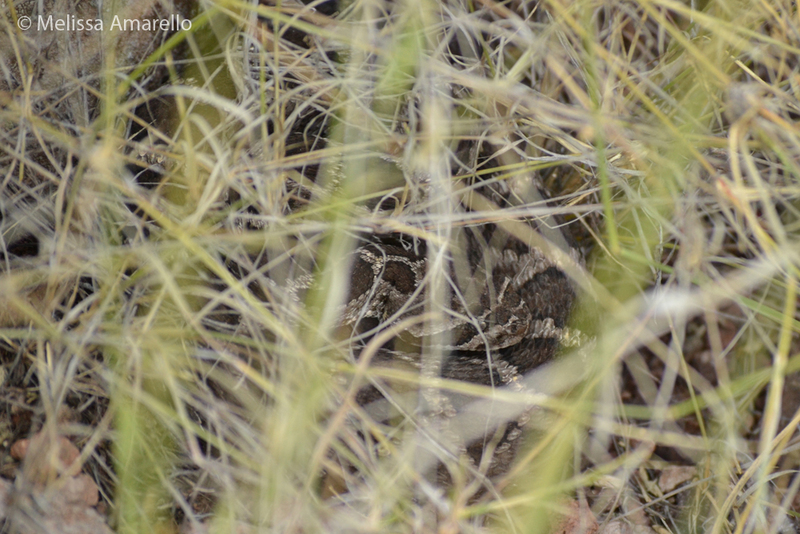 Stuart, male western diamond-backed rattlesnake, 4 July 2012. 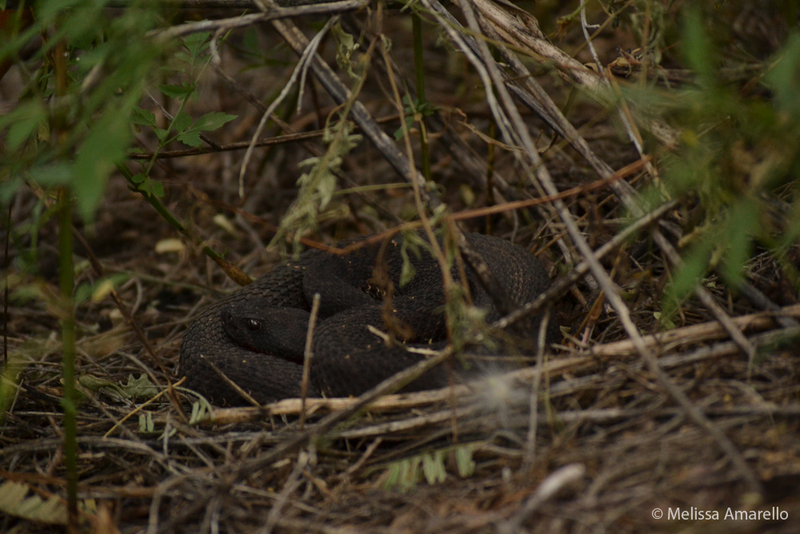 We then tracked Glendy (male Arizona black rattlesnake), who was just upstream from Stuart. Glendy appeared to have been out last night in the rain, as he was splattered with mud. Glendy, looking a little dirty after the storm, ,4 July 2012. 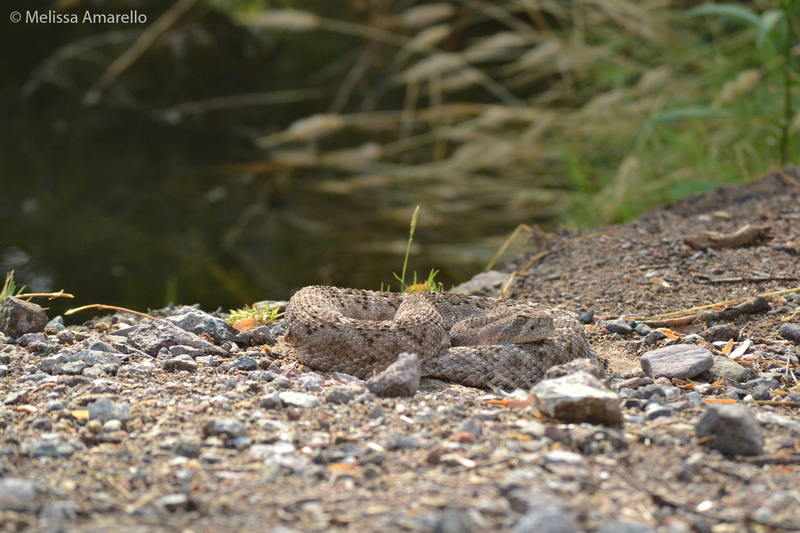 Mohave rattlesnake (Crotalus scutulatus), coiled next to the road, 4 July 2012. Mohaves have relatively more white than black (left photo), while western diamond-backeds have fairly equal amounts of both (right photo). 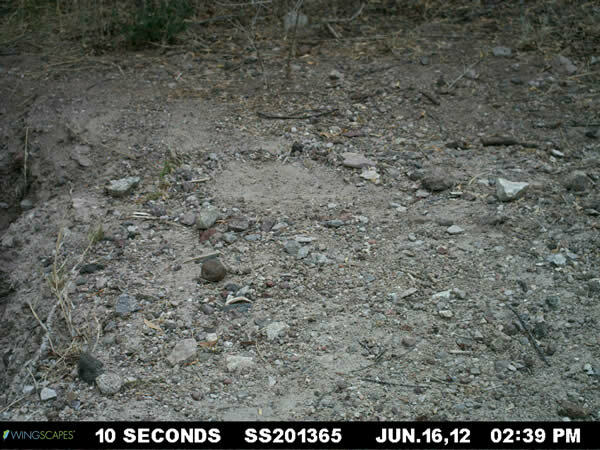 Mohave rattlesnake, unhappily showing her tail in the bottom right. The lizards and ants have been very active all day (enjoying the clouds and humidity), but we haven’t seen any more snakes… yet. As I finish this up, I hear distant thunder and its getting dark again. Hopefully we’ll luck into some more rain (and snakes!) tonight. Have a safe and snakey 4th! P.S. (5pm) It’s raining again! As I mentioned in my last post, we are in the midst of the hottest, driest part of the year in Arizona. Temperatures keep rising (over 110F in some parts of Arizona today) and the relief of the monsoon is a long way off. Or is it? Normally a desert rattlesnake would take advantage of a little storm like this to get a drink. 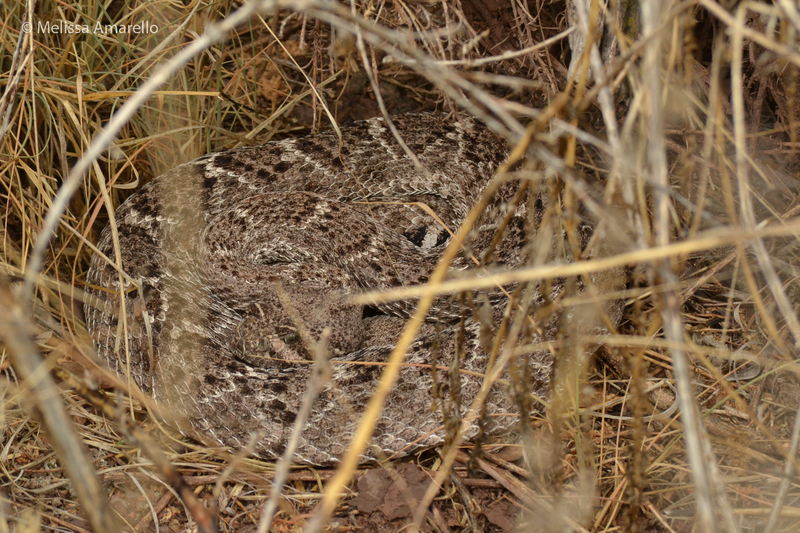 But Henry (male western diamond-backed rattlesnake) has been hanging around the “twin lakes” and hunting in that crater for about a week, so he’s had plenty of chances to quench his thirst. Can you find Henry’s crater? Here it is circled in red. Henry wasn’t the only one enjoying the weird weather. 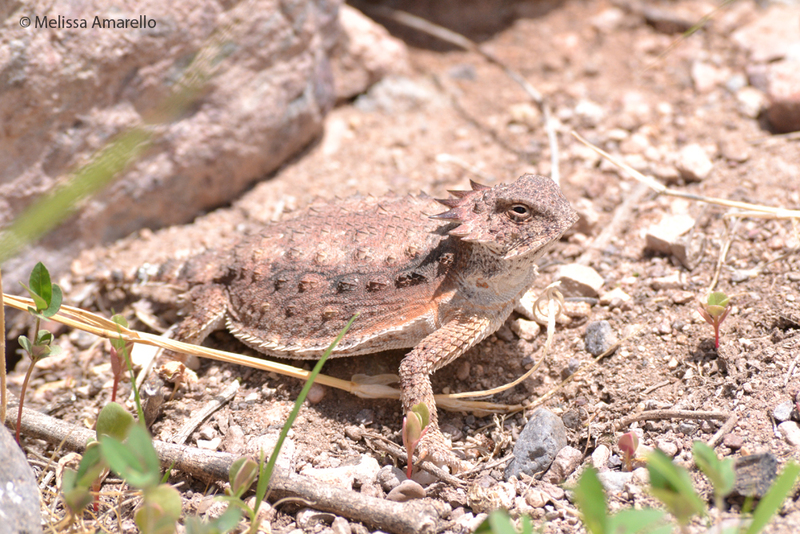 Even before the storm arrived, the humidity was up, which seemed to bring out the reptiles. This little girl was hanging out behind our house, maybe hoping for a drink? 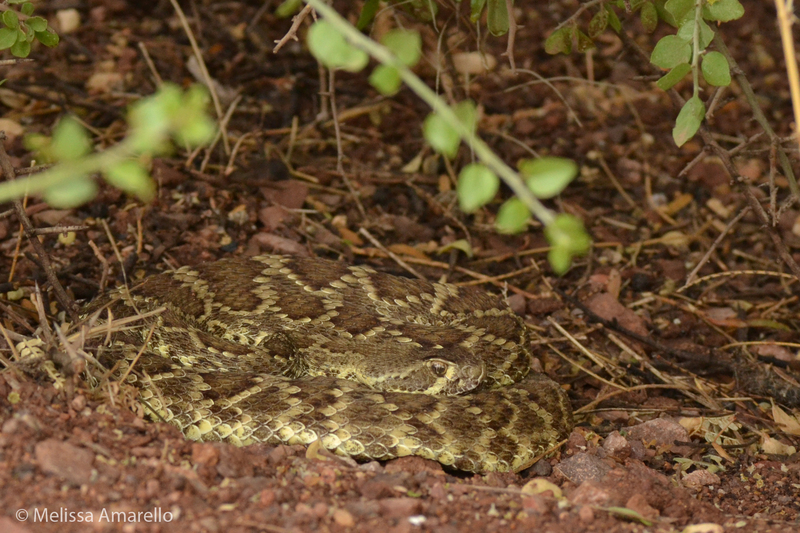 After the rain stopped, Porter (male black-tailed rattlesnake originally encountered during Snake Count) crossed the road toward the visitor’s center. He went up the stairs to a part of the building used for storage, smelling intently before coiling up on top of a wall. 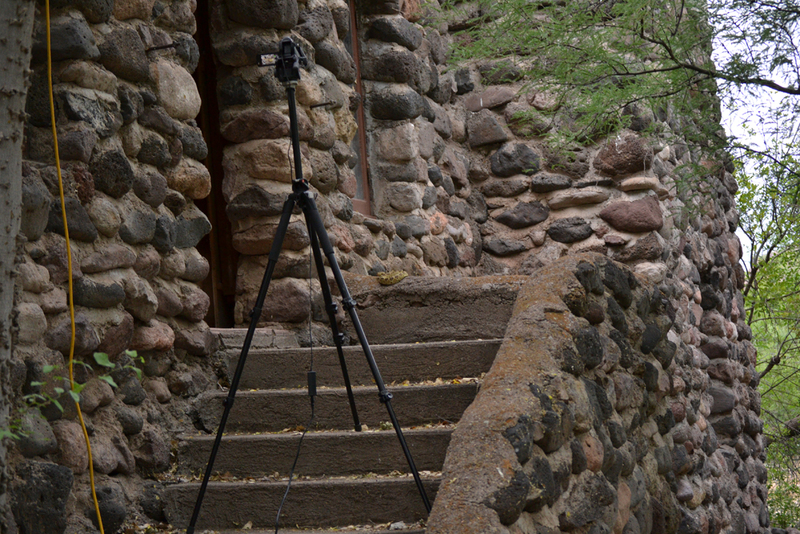 We set up some cameras on him and walked away. 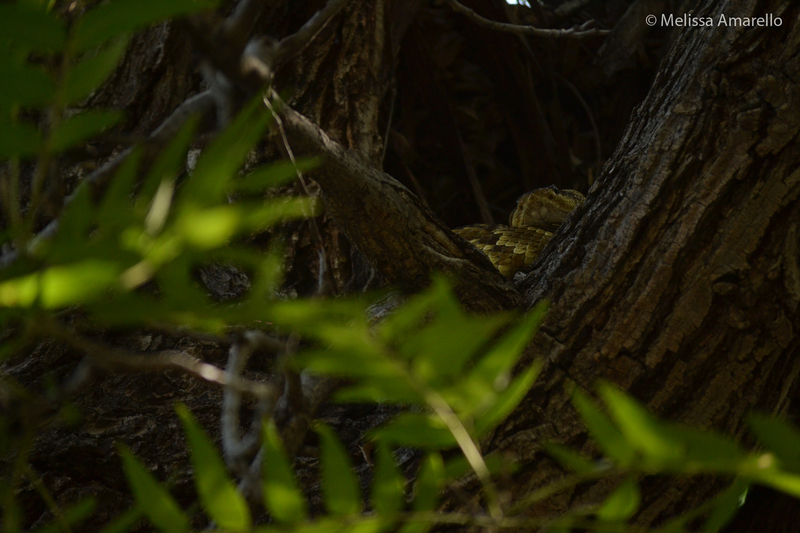 Porter (male black-tailed rattlesnake) under surveillance. While there wasn’t enough rain to measure, the spike in humidity encouraged snakes to come out. Like me, the animals also appear to be ready for the monsoon to begin.